As law enforcement officers have become more and more diligent about cracking down on distracted drivers seen texting or talking directly on their phone while they drive, most of us have taken to using hands-free devices if we feel the need to use our phone while we’re behind the wheel. This is not only to avoid receiving an expensive citation from an officer, but also to promote our own safety and that of the drivers around us. New research shows, however, that voice-activated phone systems and systems built into newer vehicles don’t make us as safe as we thought, and that distractions persist for longer than the time it takes to quickly push a button or speak a command. The AAA Foundation for Traffic Safety, in concert with the University of Utah, conducted a study on the effects of technology on drivers, namely in the form of voice-activated systems on new phones and in-vehicle entertainment systems. The researchers looked at ten different in-vehicle systems and three voice recognition systems on phones to see which ones made the greatest demand for attention on the drivers using them. Their studies measured the distraction caused to users on a scale from driving entirely without distraction, to driving while trying to memorize words and complete a math problem (not to worry–researchers simulated the experience of driving, and didn’t put drivers solving math problems out on the road). The study found that the 2015 Mazda 6’s in-vehicle entertainment system left drivers almost as distracted as were the drivers given a math problem to solve while memorizing a list of words. Among smartphone voice activated systems, Microsoft’s Cortana was found to be the most distracting to drivers, while the Google Now program caused the least distraction. The research further showed that, for around 27 seconds after a driver engaged with these systems –even just skipping a song on the music player or sending a text using voice recognition software—drivers remain mentally distracted to a degree sufficient to make them unsafe drivers. 27 seconds is enough time to travel the length of three football fields when traveling at only 25 mph. “The results indicate that motorists could not notice stop signs, pedestrians, and other vehicles while the mind is readjusting to the task of driving,” according to the president and CEO of the AAA Foundation for Traffic Safety, Peter Kissinger. 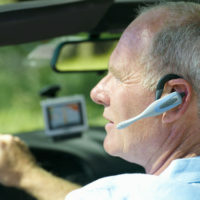 Thus, even if these hands-free systems may be legal to use on the road, that doesn’t mean they’re always safe to use, and drivers still bear a duty to use these systems responsibly so as to avoid injuring other drivers in an accident while doing so. If you or someone you love has been injured in a car accident with a distracted driver in New York, contact the seasoned and knowledgeable traffic accident lawyer at the Kingston offices of Rusk, Wadlin, Heppner & Martuscello for a consultation on your claims, at 845-331-4100 in Kingston or 845-236-4411 for our Marlboro location.